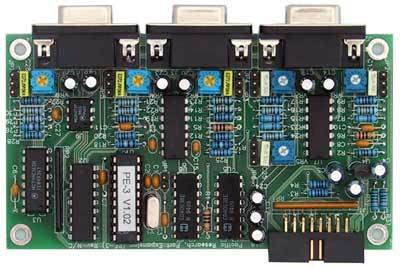 The PE-3 is a single circuit board that is connected directly to the RI-300 auxiliary buss to add 3 link ports to the controller. In addition, you can plug up to 2 PE-3s on the auxiliary buss, adding a total of 6 link ports to 1 or 2 controllers. The PE-3 supports 3 identical full duplex link ports. This means that any port can be configured to output and input audio at the same time. The only limits to the PE-3’s audio routing is that you cannot repeat audio on a port and you cannot connect ports together on the PE-3. The PE-3 can also support various remote base options. Any or all ports can be connected to the Doug Hall RBI-1 or the Pacific Research FTL-RBI. Transmit audio level output adjust on each port. Receiver audio level input adjust on each port. Transmit audio auxiliary buss channel select. Doug Hall RBI-3 full feature support on each port. Pacific Research FTL-RBI full feature support on each port. User programmable output functions, 1 and optional 8 on each port. COS and TSQ active level select for each port.